Sure, you’re aware of your own risk of developing a urinary tract infection. You’ve probably even had one before. But did you know that urinary tract infection in dogs is a fairly common problem? If not, you’re not alone. Statistically, fourteen percent of all dogs will get at least one urinary tract infection in their lifetime, so it’s important that you understand what to look for and how to treat it. Symptoms of urinary tract infection in dogs include blood in the urine, lethargy, tender stomach, fever, vomiting, loss of appetite and strained or painful urination. UTI is also a cause of excessive urination in dogs. As its name suggests, most noticeable signs of urinary tract infection have to do with urination. If your dog has been house-trained for a while and then suddenly begins urinating in odd places or at odd times, then purchase some dog incontinence diapers and take your puppy for a visit to the vet. Chances are a UTI is to blame. 1. Home remedies for urinary tract infection in dogs include giving your dog citric juices, apple cider vinegar, and frequent baths. Bacteria are also flushed out by giving your dog plenty of fluids. These remedies are best if the UTI is caught very early on, as more advanced cases will need treatment with an antibiotic. 2. Antibiotics are the method of choice for most vets. Those used to treat urinary tract infection in dogs are the same as those used for humans, and with a similar dosing schedule. Just remember that if your dog has recurrent infections, it could develop an immunity to antibiotics. 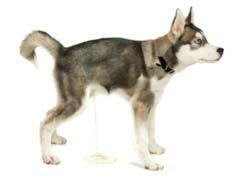 UTI in dogs is one of the leading dog incontinence causes. What starts out as a mildly symptomatic problem can lead to more serious issues if untreated, so be on the lookout for symptoms and treat as soon as possible.